I thought I’d follow on Dan Schuette’s “Invasion” post about the U.W. Campus 1967 with a memory of what I was doing about that same time. I wrote this in response to an assignment I gave my Fitchburg class around Memorial Day, 2008: “military service: how it touched me.” Military service hasn’t exactly touched me–no brother served in Viet Nam, and my father’s stories from World War II come off more as adventure tales than military service. 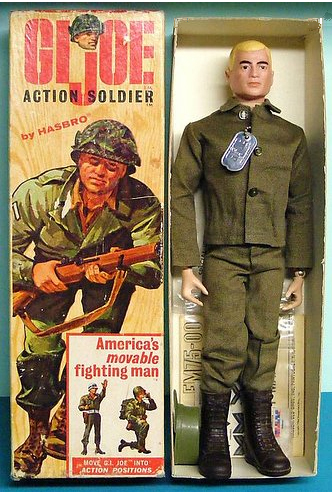 So I chose instead to muse on my childhood, where military service figured almost daily in our play. Four girls were my neighbors and playmates in the 1960s. Janet, the oldest, was a tomboy and made tomboys of the rest of us. All we did, winter, spring, summer, or fall, was play army. Our battlefield consisted of the woodlot and playing fields that curved around the high school behind our houses in Carmel, Indiana. How many acres were ours I don’t know, but it was large enough for us to lose ourselves in imagination. General Janet would decide the play, call the location, and off we’d go. We fought the American Revolution, acting out parts from “Johnny Tremain.” We joined the wild ride of Paul Revere astride fallen beech trees in the woods, smooth silver bark the flanks of our good gray steeds. We washed bandages for our imaginary wounds in the questionable water of Cool Creek at the far end of the woodlot. We spent many hours in the Indian wars, guided by the ghosts in that woodlot that had never known a plow. The Native Americans who once passed along Cool Creek had left one tree bent strangely that was, we were told, an Indian way-marker. We always took the Indian side in those frontier battles. But the Civil War was our favorite, because we had read stories about girls who ran away and dressed as boys so they could fight. That war seemed to be ours by right, and we fought it all over the woods and the fields. If a mule train was required, we rode the football team’s tackling trainer—six padded bolsters atop a padded metal frame, which transformed into animals walking nose to tail. The school’s equipment included big gunny sacks stuffed with scrap foam rubber, used by the pole vaulters to pad their landings. Three or four of these could be stacked to make serviceable horses for our troops. The question of a soldier’s proper equipment arose. Army-surplus and Boy Scout camping gear provided the canteens and mess kits we needed. But what to use for guns? My parents refused to buy me a toy rifle, on pacifist grounds. My grandfather came through, shaping a reasonable facsimile from a 2×6 in his wood shop. The other girls had less intellectual parents, and received BB rifles just by asking. What we called playing army was really playing house, although we’d have killed you with our toy guns if you said that to us. We took our settings and characters from the novels we read about war, but we never shot at one another. We just played out our fantasies of a soldier’s life. I played army by myself as well. I skipped World War I, perhaps because my brother Andy had made that his focus, with stuffed animals deployed on the living room floor. The armies of Field Marshal von Mink fought battalions led by my own special Foxy, commander of the Allied Troops but the enemy, since Andy was playing the Germans to win. This infuriated me, and the fact that my parents wouldn’t stop him from using Foxy as an enemy angered me even more. I backed the Germans myself for a short time, fighting World War II. As a School Patrol Guard, wearing my white webbing belt with the shoulder strap, I protected little children on their way to elementary school. Unknown to them, I was serving in Hitler’s SS Corps. But then I switched sides, and joined the French freedom fighters. One summer I spent a hot spell down in the cool of our basement, typing and mimeographing the propaganda leaflets I would drop from airplanes over the French countryside. My brother Andy found them and outed me to Mother. She defended me, “Well, at least she’s fighting on the right side.” After that I kept quiet about my SS activities. About the time I turned eleven, my menstrual periods started. With them, my ability to disappear into my imagination leached away. Something in my brain’s chemistry had altered. With the superb reality of my imagination dismantled, war games lost their appeal. Besides, a real war was commanding my attention. The TV brought in blood in jungles in Viet Nam and on campuses closer to home. I put away my blond wood rifle and joined the Girl Scouts. I packed brownies in popcorn to send to Our Boys. I strummed protest songs on my guitar. I learned the lyrics to Phil Och’s “I Ain’t Marchin’ Anymore,” and that was it. Playing army was over for me. This entry was posted in Sarah's memoir, Writing prompt and tagged 1960s, Carmel, summer. Bookmark the permalink. What a fascinating way to connect with “military service.” Also a fascinating glimpse into a very imaginative childhood. Had you previously made the connection between menstruation and loss of imagination, or did that arrive with writing this piece? Inspiring for both readers and writers. Thanks for commenting, Nancy. I prefer dialogue to monologue! Great story and I love the illustration — as well as the one at the top of the blog, which I only just appreciated for the first time.